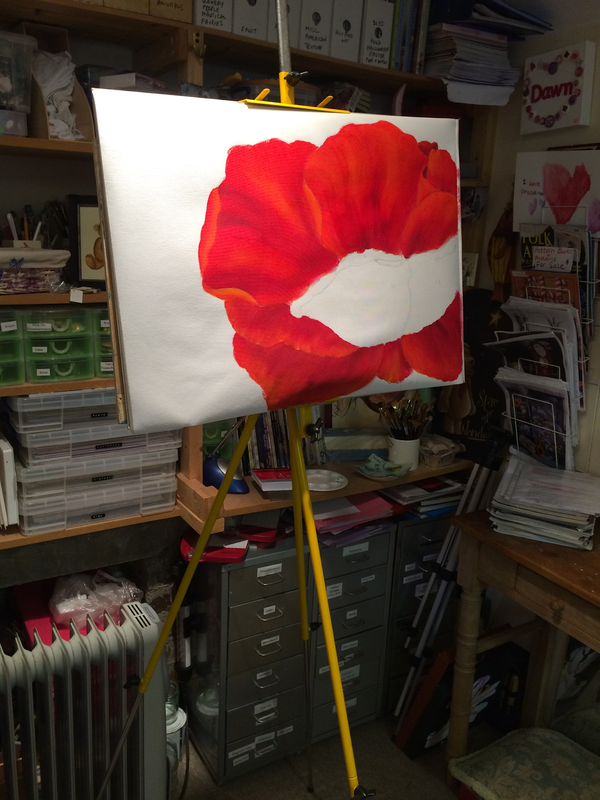 I have had such a ball sharing my large poppy canvas from a design by Shelley Hankins with two classes of 6 students over the last couple of weeks. We still have two weeks to go but their canvas’s are already coming alive with colour and I know already that they will be beautiful when finished. After transferring the basic design on to the canvas, we have been working from petal to petal, applying the paint and medium with large bristle brushes. Every petal is different whether it be due to other petals overlapping or edges that are turned back…some are large with lots of movement and others, small and tucked behind. I am enjoying demonstrating at my floor easel too…not something I do very often as I am normally seated with my students but it’s been fun. The colours are simply lush….from Cadmium Yellow to Permanent Alizarine with gorgeous orange and reds in between…with colours like this you can’t help but enjoy painting! Next week we will be bringing Sap Green into our palette…. I promise to share their final pieces with you…watch this space! This is so amazing, I am so sorry that I live so far away but I would love to have a go Dawn. It is so inspiring!!!!! !